Biography & Genealogy: Holmes Conrad, Class of 1858. Born- 31 January 1840. Matriculated from Winchester, VA. At VMI for 1 year. At UVA 1858-1860. Military Record: Enlisted 19 April 1861 at Newton for 1 year in Company A, 1st Virginia Cavalry. Made 1st Sgt. Transferred to 7th Virginia Cavalry late 1861 or early 1862. On 6 June 1862 near Port Republic captured English soldier of fortune Sir P. Wyndham. Unofficial source says he was Assistant Adjutant General to Brig Gen T. Ashby. Appointed 1st Lt and Adjutant, 17th Virginia Cavalry Battalion (1st Virginia Cavalry Battalion) on 20 November 1862. Unit became 11th Virginia Cavalry February 1863. Resigned 7 November 1863 for personal reasons, but remained with the regiment as Pvt. Courier for Brig Gen (later Maj Gen) T.L. Rosser, spring of 1864. Made Capt and Assistant Commissary of Subsistance 29 April 1864. In fight at Ashland on 1 June 1864, he seized the colors of the 11th Virginia Cavalry and led the charge that put the enemy to flight. Rosser wrote that he displayed, "the most intelligent gallantry I ever saw exhibited upon the battlefied or elsewhere." On staff of Brig Gen J.D. Imboden and again with Rosser as Inspector General and provost marshal. 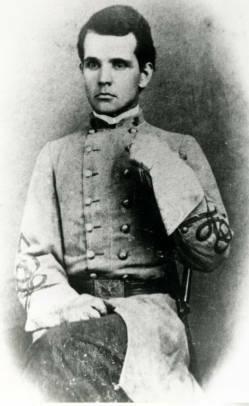 Made Major in the fall of 1864. Rosser called him "an officer of the first order talents and capabilities." Paroled in Winchester on 27 April 1865. Post War Career: Teacher, Lawyer, Public Official. Represented Frederick County and Winchester in the Virginia House of Delegates 1881-1882. Democrat. US Presidential elector 1892. Solicitor General of the US and Assistant Attorney General of US, during the second G. Cleveland administration. Brother of Conrad, CF (VMI Class of 1865). Son was Robert Conrad (VMI Class of 1905) who was killed in action during the Battle of the Marne on 8 October 1918. Died- 5 September 1917 in Winchester.